This article is about the letter of the alphabet. For other uses, see D (disambiguation). For technical reasons, "D#" redirects here. For D-sharp, see D♯ (disambiguation). For technical reasons, ":D" redirects here. For the keyboard symbol, see List of emoticons. D (named dee /diː/) is the fourth letter of the modern English alphabet and the ISO basic Latin alphabet. The Semitic letter Dāleth may have developed from the logogram for a fish or a door. There are many different Egyptian hieroglyphs that might have inspired this. In Semitic, Ancient Greek and Latin, the letter represented /d/; in the Etruscan alphabet the letter was superfluous but still retained (see letter B). The equivalent Greek letter is Delta, Δ. 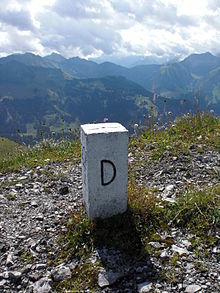 The letter D, standing for "Deutschland" (German for "Germany"), on a boundary stone at the border between Austria and Germany. In most languages that use the Latin alphabet, and in the International Phonetic Alphabet, ⟨d⟩ generally represents the voiced alveolar or voiced dental plosive /d/. However, in the Vietnamese alphabet, it represents the sound /z/ in northern dialects or /j/ in southern dialects. (See D with stroke and Dz (digraph).) In Fijian it represents a prenasalized stop /nd/. In some languages where voiceless unaspirated stops contrast with voiceless aspirated stops, ⟨d⟩ represents an unaspirated /t/, while ⟨t⟩ represents an aspirated /tʰ/. Examples of such languages include Icelandic, Scottish Gaelic, Navajo and the Pinyin transliteration of Mandarin. The Roman numeral Ⅾ represents the number 500. D is the grade below C but above E in the school grading system. ᴅ ᴰ ᵈ : Small capital D and various modifier letters are used in the Uralic Phonetic Alphabet. In British Sign Language (BSL), the letter 'd' is indicated by signing with the right hand held with the index and thumb extended and slightly curved, and the tip of the thumb and finger held against the extended index of the left hand. ^ "D" Oxford English Dictionary, 2nd edition (1989); Merriam-Webster's Third New International Dictionary of the English Language, Unabridged (1993); "dee", op. cit. ^ Lynch, John (1998). Pacific languages: an introduction. University of Hawaii Press. p. 97. ISBN 0-8248-1898-9. ^ Gordon, Arthur E. (1983). Illustrated Introduction to Latin Epigraphy. University of California Press. p. 44. ISBN 9780520038981. Retrieved 3 October 2015. ^ Everson, Michael (2006-08-06). "L2/06-266: Proposal to add Latin letters and a Greek symbol to the UCS" (PDF). ^ Cook, Richard; Everson, Michael (2001-09-20). "L2/01-347: Proposal to add six phonetic characters to the UCS" (PDF). Wikimedia Commons has media related to D.